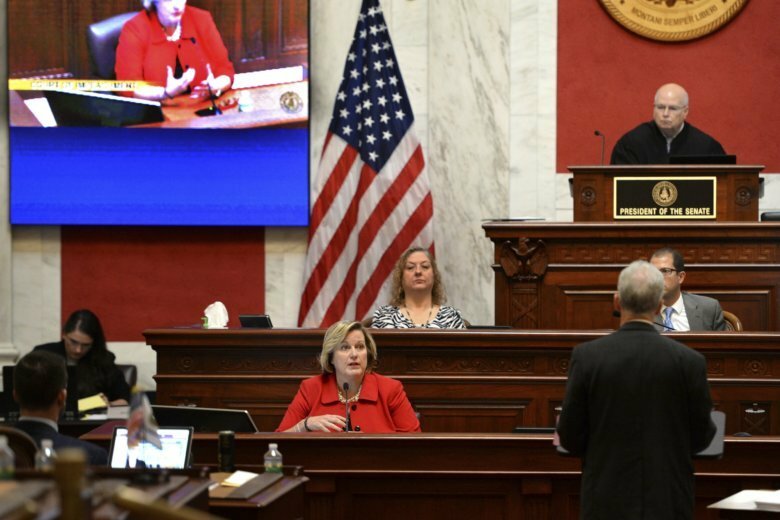 CHARLESTON, W.Va. (AP) — West Virginia senators voted Tuesday to allow Supreme Court Justice Beth Walker to remain in office following a two-day impeachment trial. The vote was 32-1 with one senator absent. A two-thirds majority was required to remove Walker, whose 12-year term expires in 2028. Senators later adopted a resolution by voice vote to issue a public reprimand of Walker. Walker was accused of abusing her authority. The impeachment charge stated Walker and other justices failed to control office expenses and maintain policies over matters such as working lunches and the use of state vehicles and office computers at home. The vote came after two hours of deliberations and exactly five weeks before the general election, when half of the Senate seats are at stake. It also occurred the same day that a federal jury was selected in the criminal trial of suspended Supreme Court Justice Allen Loughry. A 25-count indictment includes allegations that Loughry repeatedly lied about using his office for personal gain. Loughry has pleaded not guilty to the indictment. Opening arguments are scheduled for Wednesday. The House of Delegates in August impeached Loughry, Walker and justices Margaret Workman and Robin Davis. Some Democrats have called the impeachments a power grab by the Republican-led legislature, strategically timed so GOP Gov. Jim Justice could name U.S. Rep. Evan Jenkins and former House Speaker Tim Armstead to temporarily replace Ketchum and Davis while running for their spots on the bench. Jenkins and Armstead are among 20 total candidates seeking those seats in a Nov. 6 special election. Judicial elections in West Virginia became nonpartisan in 2016. Walker is a Republican. The impeachments stemmed from questions involving lavish renovations to the justices’ offices. Individual office spending included $503,000 by Davis, $367,000 by Loughry, $131,000 by Walker and $113,000 by Workman. Those questions evolved into accusations of corruption, incompetence and neglect of duty. During a time of annual midyear budget cuts in recent years, the Legislature’s budget dropped 4.1 percent from fiscal 2015 through fiscal 2018, while the state Supreme Court received a 7.5 percent budget increase over the same period. A proposed constitutional amendment on the November ballot would give the Legislature more budgetary control over the judiciary. Currently the Supreme Court sets and controls its own budget. Opponents of the proposed amendment say that would infringe on the courts’ independence. Democratic Sen. Stephen Baldwin of Greenbrier County cast the lone dissenting vote. The House previously chose not to impeach Walker for her office renovations, far less than what some other justices spent. House judiciary chairman John Shott earlier had worked out a settlement agreement to have Walker’s impeachment charge dropped before the Senate rejected the offer last month. In federal court, Loughry also is charged with making personal use of a state vehicle and credit card, and trying to influence an employee’s testimony and a federal grand jury investigation. The indictment accuses him of “creating a false narrative” about an antique desk and leather couch he had transferred from the Supreme Court offices to his home, and that he repeated the false narrative to an FBI special agent during a March interview. Loughry, in consultation with the other justices, had constitutional autonomy in deciding how the system spends a $139 million annual budget. He was removed and suspended without pay earlier this year by the state’s high court. Loughry has repeatedly denied involvement in renovations of his office, which cost $353,000 and included a $32,000 blue suede couch and a $7,500 wood-inlay floor map of West Virginia. He made one such denial to the House Committee on Finance in January. He blamed the spending on former court administrator Steve Canterbury, whom he fired in January 2017. Loughry also had a $42,000 state-owned antique desk moved into his home. He returned the desk after news outlets asked about it. Impeachment trials are set later this month for Workman and Davis and next month for Loughry. Davis announced her retirement shortly after her impeachment, but the Senate also rejected a resolution that would have dropped charges against her.